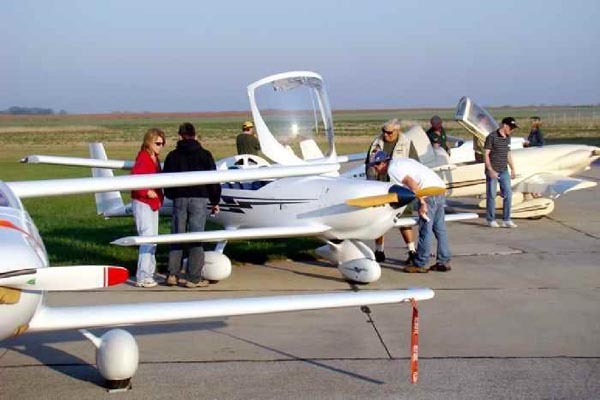 Great Weather, Great Location, Great People result in a Great Fly-in! It was like throwing a party for friends. 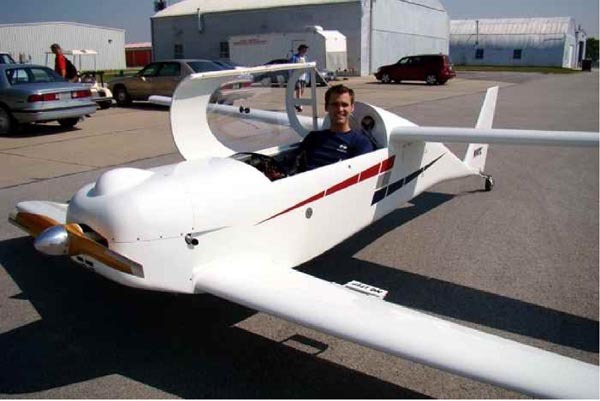 We had 11 tandem wing airplanes at this year's event. 3 Dragonflys with all the landing gear styles were represented; Wayne Ulvestad -Mark I, Greg Bruns Mark II, & Chuck Ufkes Mark II Hoop. Those that drove in were Jerry and Nancy Marstall, Sam Kittle, Jim DeBower, Alan Thayer and his green shorts, Charlie Howe, Mitch Hargin & Pam Carson. I hope I didn't forget anyone. At the pizza feed Friday night I counted 28 bodies in attendance. After the aircraft were put to bed, the hangar flying continued in the lounge area at the New Victorian Inn. Saturday saw lots of flying; both in the air and in the hangar. Lynn French gave a ride to a local newspaper reporter and Paul Fisher kept his promise to give a ride to Judy from the New Victorian Inn. We gave the airport some good publicity by getting a front page, color story of our event in the local newspaper. In the afternoon, everyone crowded into the pilot's lounge to watch Alan Thayer's video of the Q wing load test that was performed at the Livermore fly-in this past August. See complete story on page 4. On Saturday evening we gathered at Risky's Sports Bar & Grill for a great dinner. We did have to go back to the airport for our awards presentations as the Husker football game had been moved to a night game and we could not compete with the crowd noise. While waiting for a few people to arrive back at the airport I attempted to make everyone laugh by telling a joke. Well I botched it badly and I got a bigger laugh that lasted for the rest of the event. I think Kevin Boddicker may still be laughing. He knew the joke and just let me do my thing. Thanks Kevin! Lynn French won Best Interior. 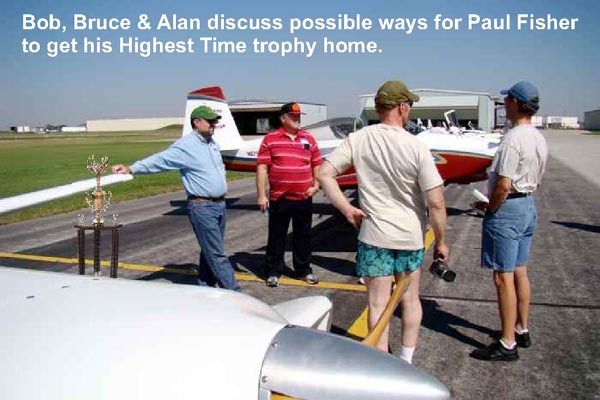 Terry Crouch took home the Best Overall aircraft and Paul Fisher took home a rather large trophy for Highest Time aircraft. Paul, who was in charge of getting the awards this year, assured me it was just a coincidence that the rather large size of this year's Highest Time trophy had nothing to do with Sam Hoskins absence. I'll let you decide Sam. The airport rolled out the red carpet for us. Trash cans, chairs, tables, a ladder to take the group photo, two nice courtesy cars, a large hangar and 2 T-hangars, a golf cart to make me look official and for Honey Lamb Crain to quickly get to the bathroom. They gave me a key to the pilots lounge and showed me where other keys were. They gave me the code to the gate. Combine this with 2 large runways, 3 hotels and Wal-Mart within a reasonable walk, restaurants within a 2 mile drive, this is a great location. With your donations, I filled up the courtesy cars with gas and left the manager a cash donation and a Thank You card signed by most everyone in attendance. I told them we would be back next year. I also want to thank Lynn French's father-in-law, Gene Bargman, for providing a few extra chairs for us as well. The weather appeared to be relatively good for the trips to and from the event. If only I could bottle it and use it again next year! 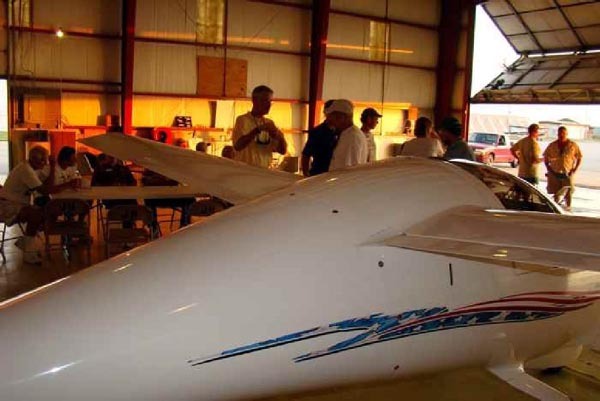 Nathan Peck reminisces about his old Quickie days at this year's Field of Dreams Fly-in. You can order a printed copy of Q-talk #131 by using the Q-talk Back Issue Order Page.